Ulnar tumors are uncommon in dogs and very rare in cats. The most common tumor of the ulna is an osteosarcoma, although any primary or metastatic bone tumor can involve the ulna. Radiographs are recommended for determining the presence, location, and extent of ulnar tumors. CT scans may be required for distal ulnar tumors to assess whether there has been any invasion into the radius. Biopsy is rarely required because treatment is the same regardless of tumor type. Thoracic radiographs or CT scans are recommended to assess the lungs for metastasis. Partial ulnectomy is recommended if the tumor is located in either the mid or distal ulna. Arthrodesis (or fusion) of the carpal joint is sometimes recommended if the carpal joint is unstable following resection of the distal ulna, however this is not common in dogs even with resection of the styloid process. Limb amputation is recommended for proximal ulnar tumors because of the inability to reconstruct the elbow and preserve elbow joint function following tumor excision. Postoperative chemotherapy is recommended for dogs with osteosarcoma. 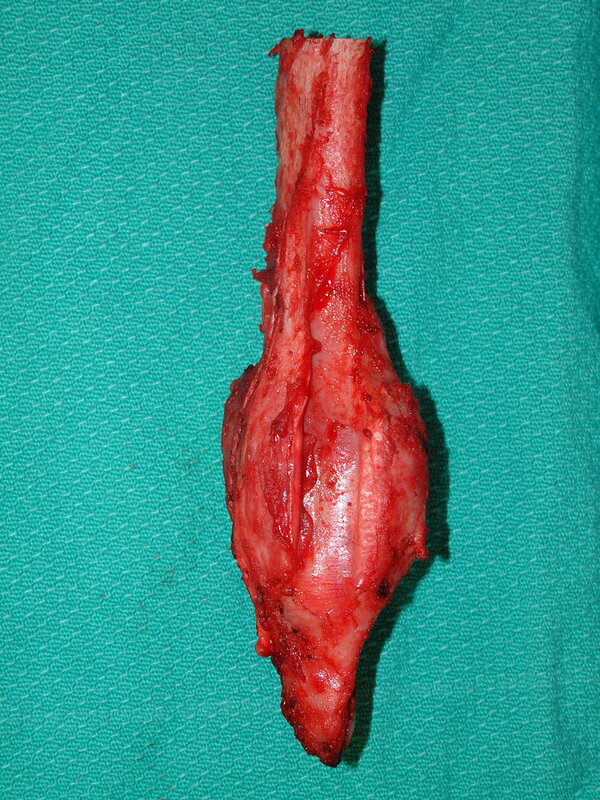 Limb function is good to excellent following partial ulnectomy, even with resection of the styloid process of the ulna. In one study of 30 dogs with ulnar osteosarcoma treated with either partial ulnectomy or limb amputation and chemotherapy, the median survival time of 463 days. The only poor prognostic factor identified was histologic subtype: dogs with telangeictatic osteosarcoma were 7-tikes more likely to die of their disease with a median survival time of 208 days.